Presenters, from left to right: Jolanta Sander, IRS; Kimberly Edwards, IRS; Larry Langdon, Mayer Brown LLP; Jean Pawlow, McDermott, Will & Emery; and Gloria Sullivan, IRS. 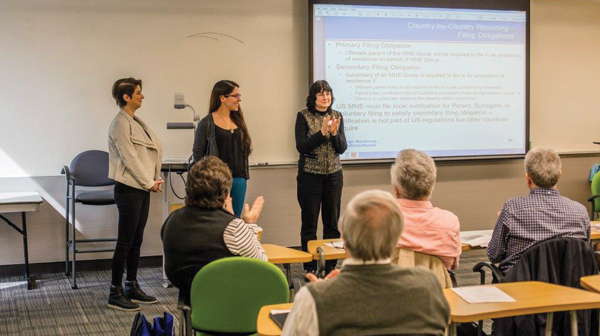 The San Francisco Chapter of TEI held its annual IRS Day on Wednesday, February 22, at Golden Gate University in San Francisco. The IRS panel included Kimberly Edwards, director, western compliance practice area; Jolanta Sander, director, field operations west, cross borders activities; and Gloria Sullivan, director, financial institutions and products. The program was moderated by Larry Langdon, a partner in the tax controversy and transfer pricing group of Mayer Brown LLP’s Palo Alto, California, office, and Jean Pawlow, a partner in the tax controversy group in the Washington, D.C., office of McDermott, Will & Emery. Scholarship presenter Josette Castagne-Kwok, San Francisco Chapter scholarship chairperson (right), and scholarship winners Sally Farahani (left) and Elana Sharir (center). The San Francisco Chapter’s annual IRS Day began with an update from Edwards and Sullivan on the latest in LB&I restructuring, IRS campaigns, and examination processes. This discussion was followed by a lively question-and-answer session moderated by Langdon and Pawlow. Sander led the final session, which focused on the IRS’ ongoing activities in the area of country-by-country reporting. She discussed filing obligations as well as other practical considerations applicable to U.S. multinational enterprises. The program culminated with Chapter representatives presenting scholarship awards to two Golden Gate University students. 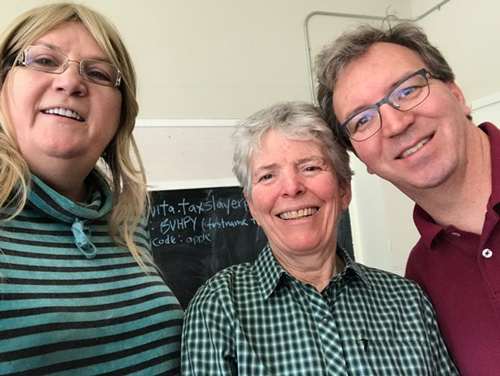 Chapter members, from left to right: Roni Height, Karen Bowen, and Rob Fore.